When we bought Hermit Creek farm back in 1989, we made an important decision for ourselves and for the people who would come to rely on us for their food to farm using organic methods. We made an equally important decision in 2000 to take the extra step and become USDA certified Organic. It's our firm belief that organic certification has made us better farmers and in turn is our assurance to you that you are getting the healthiest food available. Organic is our assurance to you! Organic farms consider the long-term health of the land; aiming to both produce food and establish an ecological balance. Organic farmers are custodians of biological diversity at all levels; from the small-scale gene health of seeds to large-scale ecosystem health. Food is a "language" spoken in every culture. By making this language organic, you allow for an important cultural revolution where diversity and biodiversity are embraced. The simple act of choosing organic is an act of both biological and cultural conservation. In the short run, organic agriculture is not necessarily the most efficient farming system; it is slower, more complex, and labor intensive. But for the sake of our long-term health, organic should be celebrated at every table, every meal, every day. Piper, grand daughter of a CSA member, loving her Winter Share! Organic, it's just good old common sense. We believe in the old adage, "you are what you eat," and besides organic being healthier for you, your farmer, and the land, it plain tastes better too! For more information, please visit these sites: Food, Inc, Organic, It's Worth It, and Demand Organic. What's up at Hermit Creek? CSA Sign-up Is Now Open. Although winters long nights and short days envelope Hermit Creek Farm, we are already busy making plans for the season to come. Join us today! We believe in the old adage, "you are what you eat!" and besides our belief in organic food being healthier for you, it's also healthier for your farmer and the land. 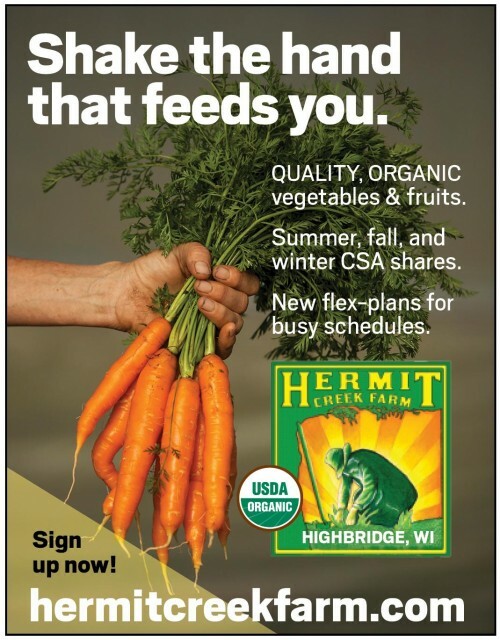 At Hermit Creek, we're serious about how we farm, we're serious about our health, and we're serious about your health as well. Certified organic, it's simply plain old common sense. All content property of Hermit Creek Farm.